Batu Ferringhi Beach is a clean beach with a long coastline. You can just lay back and sunbathe on the white sand or avail the speed boating facility at the place. A leisurely walk along the beach will help you de-stress yourself. You can even enjoy a horse-ride along the coastal line. Evening is the best time to visit the beach. It offers a spectacular view of the sunset. 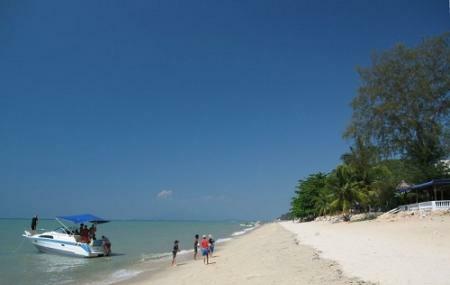 Come along with your dear one to Batu Ferringhi Beach to spend some quality time. Use Batu Feringghi trip planner to visit Batu Ferringhi Beach and many others to your visit. You can enjoy a comfortable stay in the city by booking the best hotels in Batu Feringghi like Luxfort 118 Service Suites, Glow Penang, Hotel Sentral Seaview, Penang and Desa Pelangi Condo. Chalk out the best way to discover the city with Batu Feringghi vacation packages. Check out various modes for how to reach Batu Feringghi. Love this? Explore the entire list of places to visit in Batu Feringghi before you plan your trip. Fancy a good night's sleep after a tiring day? Check out where to stay in Batu Feringghi and book an accommodation of your choice. How popular is Batu Ferringhi Beach? People normally club together Craft Batik and Penang Floating Mosque while planning their visit to Batu Ferringhi Beach. Wide open beach with very few people around which I enjoyed. Not so clear water but well, it was clean enough. Most of the shadow spots below threes were occupied by people renting watersports gear or offering massages. Nice place to unwind. Waters aren't the cleanest, but there is a small massage parlour right on the beach, and it's a relaxing experience to take a massage and hear the sounds of the sea. Few shacks to sit and have beer on the beach, and are some of the best experiences that you can have. Few water activities, which didn't try, but are still an option for the interested. Nice view especially on evening watching the sunset. For those who want to release a tension, this place is the best place to go.. The breeze was so fresh and relaxing. At night it's cool to sit on the beach with friends or with your lover. Not much cheap restaurants there though. If you're going with your own car to the beach from town, you better be careful in driving since the way ia dangerous. Anyway, beach is great! You can get Parachute or banana boats in the day time. There are night markets along there where you can buy souvenirs, toys, clothes or gifts and even foods maybe.